A chance visit to a garden centre sowed the ‘seed’ of an idea for Simon Fitton earlier this year, which, with a bit of help from UrbanCrazy, finally came into bloom in August. 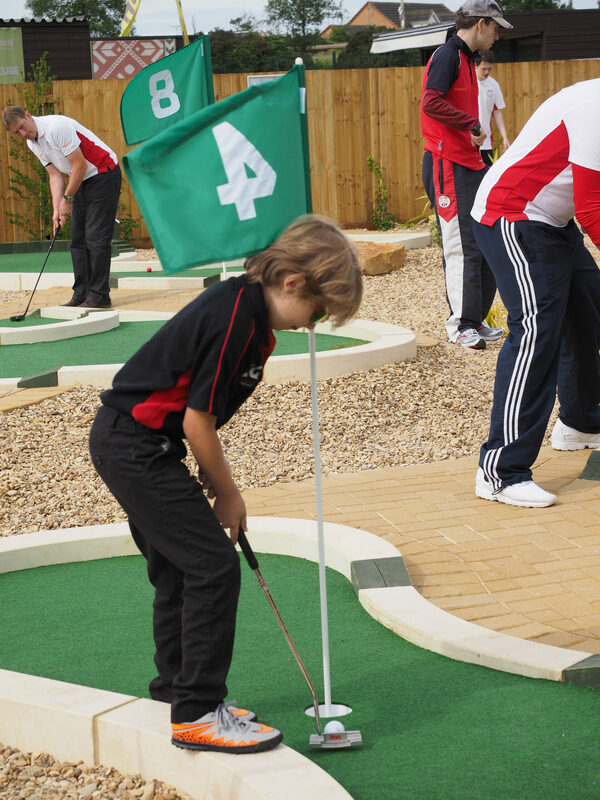 As a golf pro and successful golf club owner Simon had been looking to ‘branch’ out into the world of mini-golf but had not found the right location for his venture. When he stopped off to take a call in the car park of Dobbie’s Garden Centre in Peterborough he knew he had found the ideal spot and immediately spoke to the manager. Within a few days things started to take ‘root’. Simon, along with his father Roger and sister Lizzie, own and run two golf courses – Thorpe Wood and Orton Meadows – and between them know a lot about golf. But when it came to the mini version they were happy to trust in our knowledge and experience to create a course that was interesting, exciting and viable. On the opening day everything most definitely came up ‘roses’ and everyone that attended had a great time in the sunshine. The Fitton family were really pleased to see how popular the course was and are confident it will serve as a great family experience and hopefully a gateway for younger people into regular golf. One young man who is already a big name in the game’s larger form is 8 year-old golf prodigy Jayden Phipps. Jayden had little trouble mastering the course but even he found some of the holes tricky at first, mainly due to the fast green speeds. Despite that he still managed to get a couple of holes-in-one along the way, and really enjoyed playing the course. Our Project Manager Jon Angel really ‘dug deep’ into his imagination in designing this 12-hole course which comes complete with ‘rough’ sections, run offs, undulations and doglegs, making for an enjoyable experience for all ages. 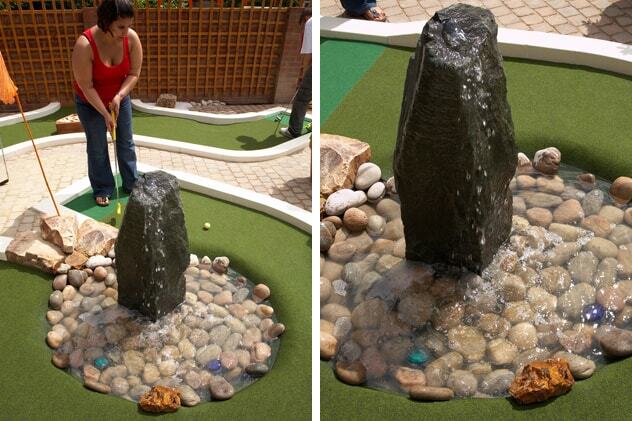 Hole 3 is designed in the shape of a flower, harmonising nicely with the garden centre environment. Holes 11 & 12 share a fiendish water hazard, which not only tested the skills of the many members of the public who played, but also the Great Britain Minigolf Team who were out in force to tackle the course ahead of their imminent trip to the World Minigolf Championships. 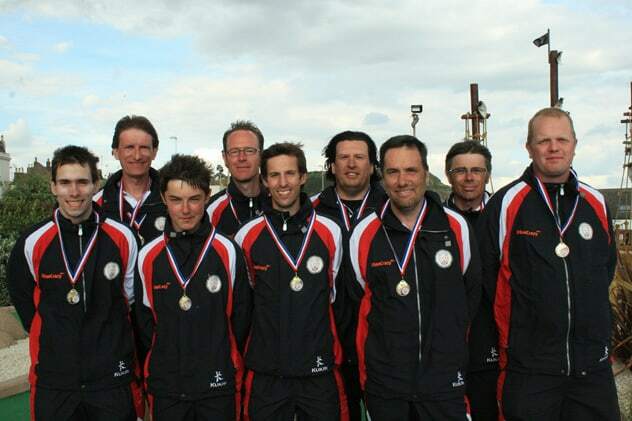 Despite the odd soggy shot the team consistently scored in the 20s, with Tony Kelly pipping his teammates to set an impressive course record of 21! 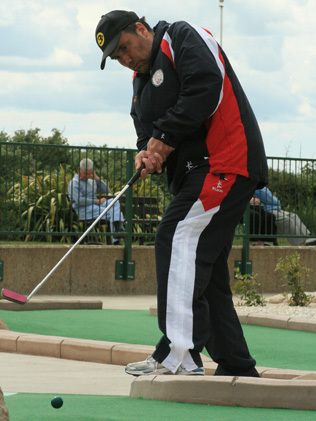 The players all agreed the course offered the right mix of tension and playability. The Lucky 13th is a bonus hole based on the traditional arcade game of Bagatelle. It adds a bit of drama and suspense… the challenge is to play the ball up a ramp and watch as it passes through a tube into a transparent box. Inside the box the ball ricochets amongst 115 pins before falling into any of 9 compartments and landing in the winning compartment triggers a light and buzzer to signal that you have won a free return visit! It’s a tantalising end to the round and I heard that 8 or so people were successful on the opening day. Chatting to visitors on the day, the message I got was that everyone was impressed by the design and style of the course. Some had played mini golf or crazy golf before at the seaside whilst on holiday, but the prospect of having a course closer to home really appealed… and ‘fuschia’ visits were already being planned!